Iowa native, athlete and adventurer Charlie Wittmack is preparing to set off for the last portion of what he’s calling the World Triathlon. The 10,000-mile trek from England to the summit of Mount Everest involves swimming, cycling and biking through 12 countries. Wittmack took a break from the trip to come home to Des Moines for the holidays. He says he’s ready to finish the journey in the New Year. Wittmack will resume his trip in late January. He’s using the event to raise awareness for humanitarian efforts aimed at reducing maternal mortality in Nepal. The expedition began this summer and has included a swim across the English Channel and a bike ride across a 12,000-foot-mountain range. In 2003, Wittmack became the first Iowan to reach the summit of Mount Everest and he says he’s aware there is a significant risk involved in making the climb again. 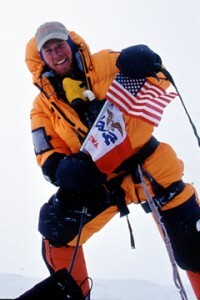 Wittmack, a lawyer from Des Moines, is one of only four people in the world who have both climbed Everest and swam the English Channel — and he’s the only American among the four. He was a recent guest on the Iowa Public Radio program, “The Exchange.” Learn more at www.theworldtri.com.